When Will Calloway is wrongly accused of a serious crime he is sentenced to join the Moon Chase to prove his innocence. While at first glance this seems pretty straight forward and fairly safe with the fell walkers and huge Fellhounds of Thesk going along to help, he soon realises that proving his innocence is the least of his challenges - staying alive is another! There is something quite enticing about this simple tale, a warm feeling that is clearly evident in the prose, a clear indication of the love and care that the author has poured into the story and characters. The structure of the narrative is clean and crisp, with uncluttered dialog that still manages to avoid that trap of sounding condescending that all too many young adult novels fall foul of. The main characters are interesting, lively and nicely coloured while the protagonist is engaging and youthfully niave in just the right measure. The plot is fairly straight forward but nonetheless very rewarding while the pace is faster than a hare on roller skates. There isn't a huge amount of back story or world building, just enough to build a vibrant picture of this Chase but nonetheless the world the story is set in has a certain quality about it, a very relaxing and rich place that you just can't help but yearn to learn more about. The fight scenes are very well choreagraphed and perfectly described but I did feel that the Fellhounds were a little underused, I would have liked to have seen more of these massive hounds than was present, but a minor niggle really. 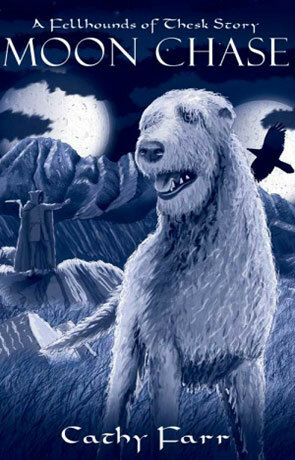 The book ends on an abrupt cliff hanger than gaurantees that there will be a second volume so perhaps we will see more of the Fellhounds then. Overall Moon Chase is a great young adult novel, well written in an engaging manner with a strong voice and noteworthy story, recommended. Written on 20th July 2011 by Ant.